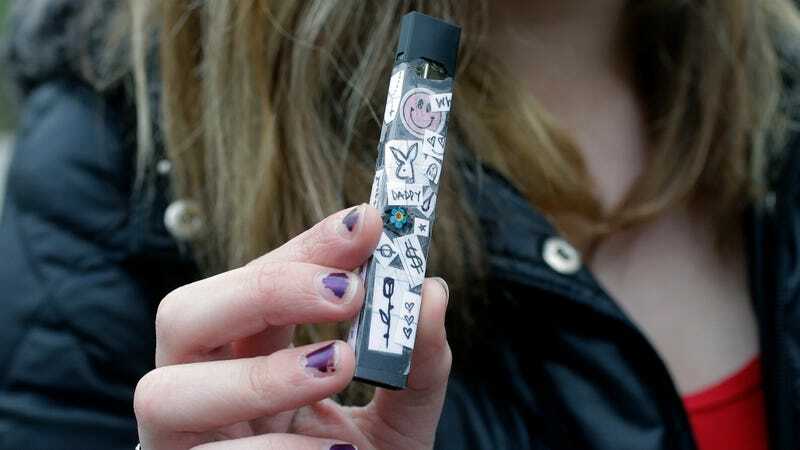 In its ongoing crusade against rad teens, the Food and Drug Administration announced Tuesday that it made a surprise inspection of the headquarters of Juul Labs, which is under investigation for potentially marketing e-cigarettes to children. The “unannounced on-site inspection,” executed on Friday, resulted in the seizure of “thousands of pages of documents,” according to the FDA. The surprise inspection of Juul continues an aggressive new chapter in the FDA’s war on the “epidemic” of underage vaping, as FDA Commissioner Scott Gottlieb recently put it. The agency has cracked down on e-cigarette businesses in general and Juul in particular. While there are hundreds of e-cigarettes on the market, Juul remains the most popular, especially among teenagers, according to Nielsen, which found that Juul represented nearly 55 percent of the e-cigarette retail market as of March. In late August, the New York Times reported that management within PAX Labs, which created Juul before it spun off into its own company, knew the company’s e-cigarettes were widely popular with teenagers and still failed to tweak its marketing strategy, according to a former senior manager at PAX. Last month, the FDA announced that it had issued 1,300 “warning letters” and fines to brick-and-mortar e-cigarette retailers that the agency said it had busted selling Juul vapes to minors during an “undercover blitz” carried out this summer. Although e-cigarettes are believed to be somewhat safer than tobacco cigarettes, and users can vape without nicotine, evidence shows they are still not safe, particularly for teens’ still-developing brains. Clarification: A previous version of this article, including the headline, indicated that the FDA “raided” Juul’s offices. To avoid confusion about the context of this federal government action, we’ve updated the article.